We have a special event this month with Ted Patrick from Adobe, an internationally acclaimed speaker, who will be talking about Flex. We also have local legend Earle Castledine talking about Yahoo pipes – what are they, why use them and more! 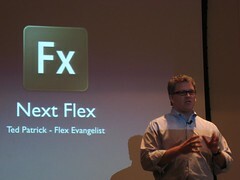 Ted Patrick: Ted is a Technical Evangelist for Flex at Adobe Systems. He worked with Flash since FutureSplash Animator and watched its evolution from animation to application. Ted also helped Adobe with the development of ActionScript 3, AVM2, ASC compiler, and Flash Player 9 for some 16 months prior to Flex 2’s release. Earle Castledine: Winner of this years tightly contested WebJam, Earle is the inventor of Web Sequins (a technology soon to be sweeping the web) as well as being one of leading figures in Yahoo Pipes tutorials.